Easter Day is filled with so many tasty foods to be enjoyed with family and friends; the day is filled with traditions that fill a home with true happiness. Easter Dinner and dessert are certainly to be enjoyed but so are these amazing and gorgeous Easter Appetizers! Entertaining, cooking for and serving your friends and loved ones is so much fun! It’s also a lot easier if you have the right tools on hand. I survive the holidays in the kitchen by having my stand mixer, apron, baking sheets, cookware, serving utensils, extra serving dishes, and flatware all ready to go! Easter Dinner and dessert are certainly to be enjoyed but so are these amazing and gorgeous Easter Appetizers! They add color to the table & taste amazing! Chorizo, Saffron And Goat’s Cheese Devilled Eggs For Easter | Eat. Live. Travel. Write. 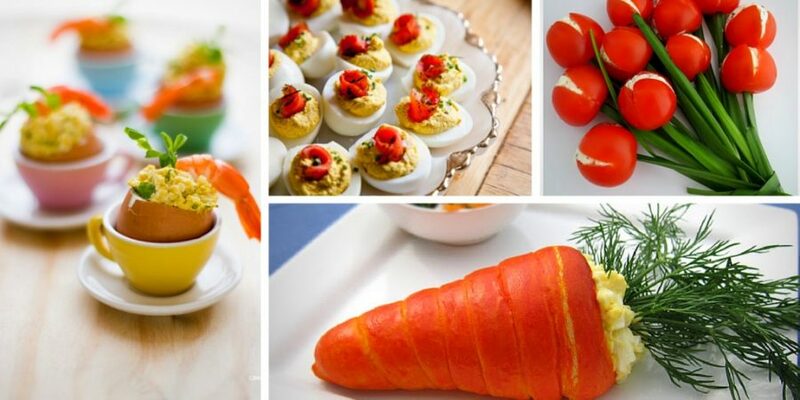 Which of these Easter appetizers are you going to make for the day? Once you decide on that be sure to check out these favorite Easter treats; they are so colorful and pretty!